I always welcome guest posts, especially from my wife, Angie Drobnic Holan, who maintains her own excellent, if intermittent, blog. Angie’s last post here was a review of Sally Rooney’ Conversation with Friends. Anna Burns is the latest in a long line of acerbic Irish writers who are able to cast jaundiced eyes on the hypocrisies and shortcomings of their own community because they know it so intimately from the inside out. Belfast-born Burns, whose Milkman won last year’s Man Booker Prize for literature, said she based the novel on life experiences. “I grew up in a place that was rife with violence, distrust and paranoia, and peopled by individuals trying to navigate and survive in that world as best as they could,” she said. 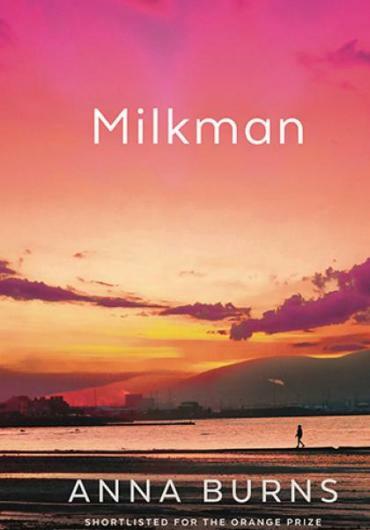 Milkman is a winding, stream-of-conscious narrative set in Northern Ireland’s Troubles of the 1970s or 1980s. We are plunged straight in: The narrator has a gun held to her chest, and the wielder of the gun is Somebody McSomebody, because the hit squads killed the milkman. But, she hastens to inform us, the so-called relationship between her and the milkman never existed. It was wanted by him and gossiped into existence by the community, but never real. That surreal set-up is gradually unspooled, logically and relentlessly, over the novel’s 350 pages. Violence, paranoia and depression hover over the community like a fog. As we come to know the narrator, we learn she is an 18-year-old woman who variously carries the roles of middle daughter, maybe girlfriend, middle sister, oldest friend. She likes to read old books — Ivanhoe, Vanity Fair — as a means of escape, and sometimes she even reads while she walks. The reading-while-walking is an act of defiance within the confines of a suffocating community, but it’s not a true escape from the ever-present political and religious divisions. Plus, it will get you branded as one of the beyond-the-pales, as Burns puts it. Here’s a passage where the narrator gets a scolding from a friend. It’s a long Irish tradition to be dark and grim while being terrifically funny. Milkman delivers. The New York Times profiles Anna Burns, outlining her struggles as a writer (both financial problems and health issues) and her thoughts on Northern Ireland. This entry was posted in Arts & Culture, Northern Ireland and tagged Anna Burns, The Troubles on April 2, 2019 by admin. I’m reading Milkman with my book club. It’s is an absolutely brilliant book. I knew Northen Ireland in the seventies was an awful place but from Anna Burns I’m learning that the awfulness was far more sinister and pervasive than I imagined. This is an important book.